The Royal Albert Hall seems to be looking better than ever these days. Before Seth Lakeman took to the stage you could see excited revellers marvelling at the extraordinary space, it’s 5,272 seats defying its intimate nature. Seth carried on the familiar feel strolling onto the stage as if it were his front room, his easy manner and folk roots the perfect solo support for what was to come. First song ‘The Hurlers’ saw him on the viola, with guitar to follow. The charming ‘Portrait Of My Wife’, my personal favourite from the charming multi-instrumentalist. As he left the stage to resounding applause it was not the last we would see of him tonight. 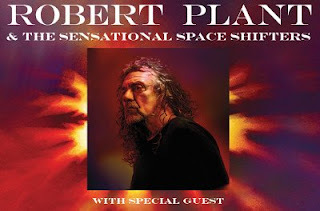 Robert Plant took to the stage with ‘New World’ the second song from his eleventh solo studio album Carry Fire and it was clear that he was eager to impress. Standing lion-like at his microphone, his curly locks like a mane, guitar’s growling, proud with good reason. With an exceptionally large back-catalogue at his disposal it’s always interesting to see which tracks make the list. All clearly well received the first Led Zeppelin era offerings was ‘That's the Way’ from Led Zeppelin III which rolled back the years for the many loyal fans gathered tonight. The 7-strong band included the return of Seth Lakeman popping up on various instruments including the double bass, as well as the ever-inspirational Skin Tyson. The Sensational Shapeshifters are a well-oiled unit clearly capable of almost any musical task. The encore saw Chrissie Hynde join the band for a duet of ‘Bluebirds Over the Mountain’ by Ersel Hickey and The Pretenders ‘2,000 Miles’ before the climax of ‘Whole Lotta Love’. A spectacular gig in a legendary venue, Plant is still at the top of his game.